Avengers: Infinity War features more super-characters than you can shake a cosmically-powered stick at. Most of them you know, and many of them have had their own movies already, from Captain America and Black Panther to Spider-Man and Doctor Strange. Even the Guardians of the Galaxy are pretty familiar at this point, but some of their supporting characters remain a little obscure. So you may be asking, what's the deal with Nebula? She's got a great look, with Karen Gillan's undeniable beauty under striking blue, purple, and metallic makeup that doesn't so much counteract her attractiveness as reshape her image into a harsh and futuristic ideal. Everyone knows that some of the Marvel Cinematic Universe characters are closer to their comics counterparts than others, but unless you've spent decades reading the Marvel comics set in outer space (usually simply referred to as their "cosmic" comics), you may not know the true history of Nebula. Here's a quick look at that history, and where it may lead when it comes to her role in the movies. When Nebula first appeared in Avengers #257, Thanos wasn't even around. He'd been turned to stone years earlier, and although he wasn't technically dead, he was just as out of the picture. One of the first actions Nebula took in those comics was to claim Thanos' former headquarters, the Sanctuary II, for her own. 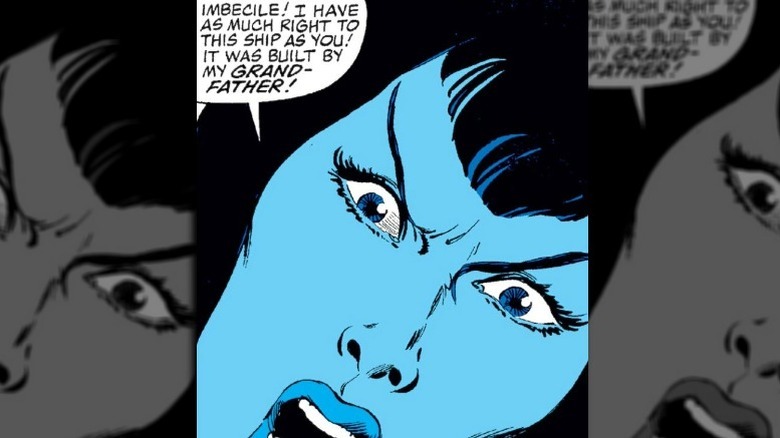 When Starfox, Thanos' brother, claimed it as his familial right, Nebula made the claim that would come to define her: the space station was rightfully hers, because Thanos was her grandfather. Thanos, like Starfox, is an Eternal. As the name implies, they've been around a long, long time. That makes it very believable that Thanos has descendants out in the Universe that nobody necessarily knows about. Later stories would confirm that Thanos spent his years siring as many children as possible in an attempt to grow his power. So while Nebula didn't come forward with any proof of her relationship to Thanos, it certainly seemed possible. 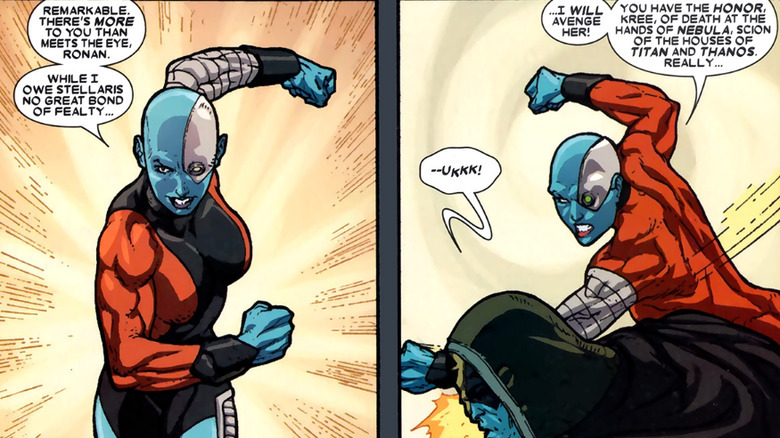 In her early appearances, Nebula looked very different from the bald cyborg she would eventually become. She was a fully organic humanoid alien, although you might be confused by the gauntlets that enable her to fire destructive beams from her wrists. She had long bluish-black hair which rose up in big curls on the sides in one of those hairstyles that's only possible in comics. 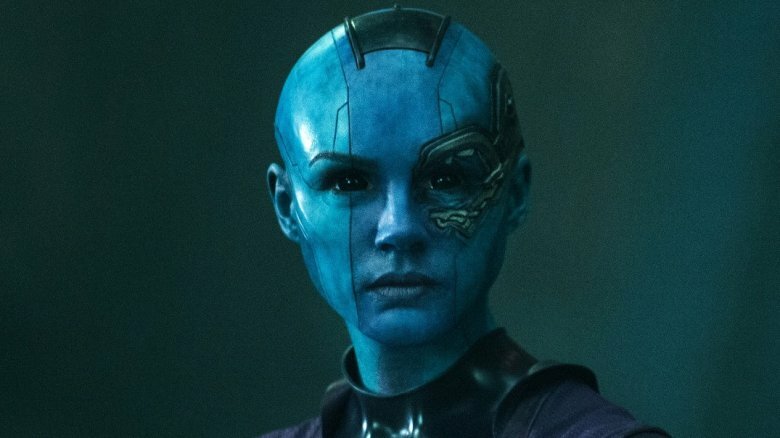 If you're familiar with the alien races of the Marvel Universe, you might guess that Nebula's blue skin means that she's a Kree, like Ronan the Accuser. In fact, she's from a race called the Luphomoids. There are only a few of them left in the galaxy, because Galactus ate the planet of Luphom and only those Luphomoids who were off-planet survived. Other Luphomoids like Zorr, a villain who first appeared in Nova #1, were desperate to find a new home world for their people. Nebula never seemed interested in that. Being a space pirate and the leader of a fleet of mercenaries seemed to be her truest calling. She also once claimed Zorr was her father. Whether that makes him related to Thanos, or whether either of her claims is even true, is unproven. Whether Nebula was being honest about her relation to Thanos was never particularly relevant as long as he wasn't actually around. Being a pirate and mercenary gave her plenty to do in the universe-hopping Marvel Comics of the 1980s. Most notably, she and her fleet got into a big conflict involving the Skrulls in the pages of Avengers, and an undercover Captain Marvel (the Monica Rambeau version) even joined her crew briefly. Of course, as all classic villains eventually will, Thanos returned to life and mobility, resurrected by Death herself in Silver Surfer #34. In #38, he met the woman who claims to be his granddaughter, and he was not impressed. He claimed never to have had children, which was probably meant to be the truth at the time but became a lie in light of later stories (comics are…very complicated). Declaring Nebula's lies "unforgivable," Thanos set her on fire with beams from his eyes. He meant to kill her, but crew members on the Sanctuary II saved her life…in a manner of speaking. What was her role in the Infinity Gauntlet story? When Thanos rediscovered Nebula after their first meeting, she had been burned beyond recognition, profoundly brain damaged, and about to die for real. By this time, Thanos had assembled the Infinity Gems into the Infinity Gauntlet, giving himself vast and godlike powers. He used those powers to stop Nebula from dying — without actually healing her. She existed as a shambling, nearly mindless, charred zombie of a creature. 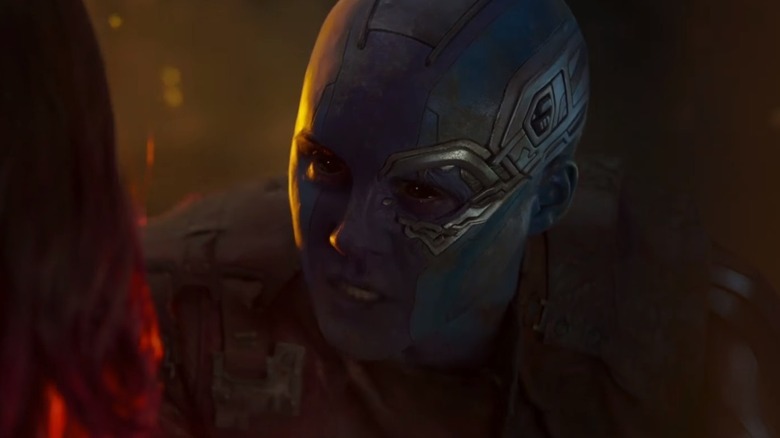 "Granddaughter Nebula," proclaimed Thanos, "know that I have immortalized you for posterity! You shall live as long as I wish you too to do so! Art you now be: a monument to the insanity of life and death denied!" 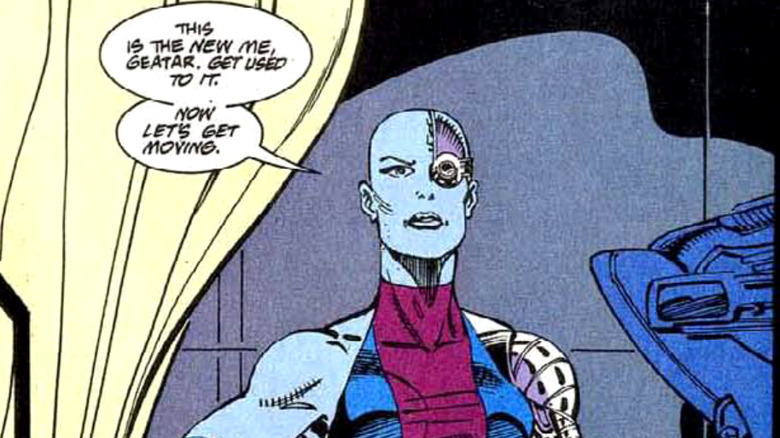 As The Infinity Gauntlet storyline got going, the wandering, corpselike Nebula was a fixture of Thanos' headquarters. She was always in the background, seemingly incapable of action. Her presence was a testament to the cruelty of the being she once called her grandfather, but ultimately it also became the key to his fall from godhood. 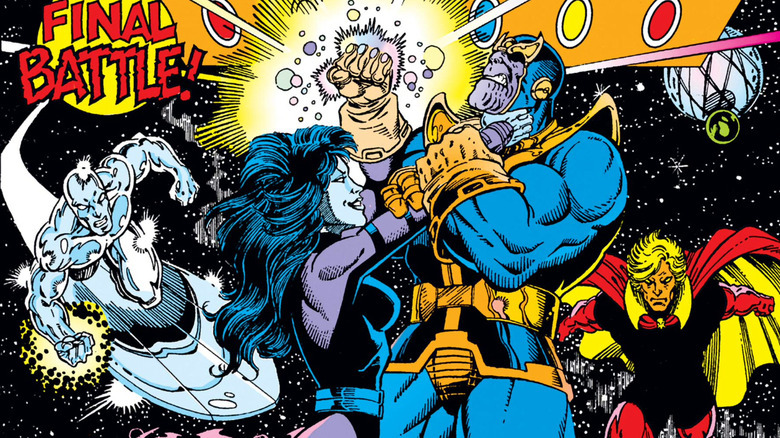 The challenge of The Infinity Gauntlet was that Thanos has already won when the story begins. He had assembled the Infinity Gems, taken on the godlike power they convey, and immediately used that power to kill half the population of the Universe. Even as the Avengers and other heroes assembled to do their best against Thanos, they knew there was really no hope. As long as Thanos wore the gauntlet, he'd be unstoppable. However, a confrontation with the cosmic being known as Eternity led to Thanos leaving his body unattended while his consciousness dealt with larger cosmic matters. This gave Nebula, who had been repeatedly described as "nearly mindless" — but apparently not entirely mindless — the opportunity to grab the Infinity Gauntlet off of his hand and claim its power for herself, immediately restoring her body and mind in the process. She didn't keep the gauntlet for long, but she enabled the defeat of Thanos, and was restored from her living-death in the process. After the events of The Infinity Gauntlet, Nebula's physical form was restored, but her brain was still damaged. Her longtime first mate, Geatar, freed her from imprisonment and took her to a rogue space surgeon named Dr. Mandibus, who promised to restore her faculties. This conversion occurred as a subplot across multiple issues of Silver Surfer beginning with #69, and when the fully restored Nebula was finally unveiled in Silver Surfer #72, she'd become a bald cyborg who should look very familiar to Marvel Cinematic Universe fans. Finally back to her mental and physical peak (and even beyond it, thanks to her cybernetic implants), Nebula returned to the life of a space pirate. She and Geatar attempted to rescue the rest of their crew from the space prison known as the Anvil, but when the Silver Surfer and Jack of Hearts thwarted the attempt, she killed her entire crew in making her escape. It might seem like Nebula had been hardened by her new partially metal brain, but in fact this was Nebula as she'd first appeared. She was always a totally callous and ruthless criminal from day one, and becoming a cyborg only facilitated her return to that life path. In Annihilation: Ronan, one of the miniseries that was part of Marvel's larger 2006 Annihilation event, Nebula was reintroduced as a member of a team of interstellar women warriors known as the Graces. The leader of the Graces turned out to be a woman with an even stronger connection to Thanos than Nebula herself ever had: Gamora. Whereas Nebula only ever claimed to be the granddaughter of Thanos, a claim never proven, Gamora was actually raised by him. Thanos wasn't even a concern when she founded the Graces, however — she was just trying to move on with her life. Initially that involved her and her team conquering the planet Godthab Omega. But when Marvel's cosmic heroes needed help against the Annihilation Wave (an invasion force from another dimension led by the Fantastic Four villain Annihilus), the Graces joined the cause. What might have become of the team remained an open question, because the event led to the founding of the present-day Guardians of the Galaxy, with Gamora as a member. As far as Marvel comics go, Nebula and Gamora never had much to do with each other until the Graces. They were both involved in some Thanos-related stories, like The Infinity Gauntlet, but they generally played unrelated roles in those stories. Even if Nebula's claims of being the granddaughter of Thanos were true (and it was often hinted that they weren't), she had no reason to claim Gamora as her aunt. Even calling Gamora the daughter of Thanos is a bit iffy, since he really just raised her as a means of creating an assassin that he could control. So until 2014, Nebula and Gamora had no real connection except that they were on a short-lived team together and both played prominent roles in Marvel's cosmic storylines. However, when Nicole Perlman and James Gunn were writing Guardians of the Galaxy for the screen, and figuring out how to translate all the complex mythology around Thanos to the cinematic universe, a story emerged that was simpler and more powerful than anything Nebula and Gamora had dealt with in the comics: a story about sisters. The Nebula of the Guardians of the Galaxy movies is, like Gamora, an adopted daughter of Thanos. There's an interesting and largely un-commented-upon difference between the two. Although Gamora (played by Zoe Saldana) is said to have had her physical abilities enhanced by surgery and other means, she still appears fully organic. She has the green skin of her species, but in interplanetary settings she can pass for "normal." 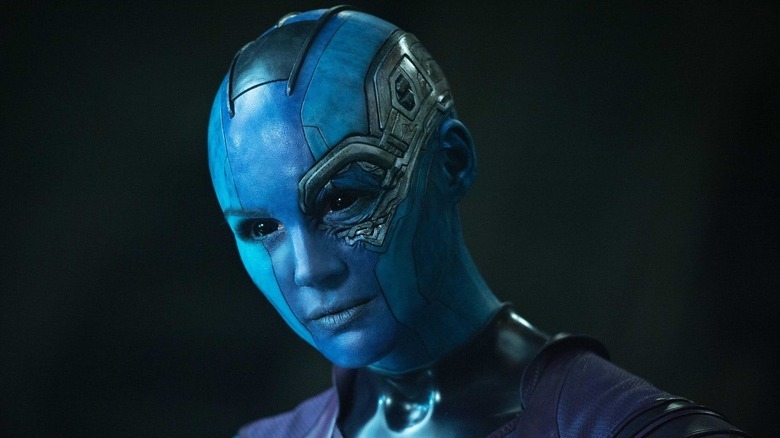 Meanwhile, Nebula, played by Karen Gillan, has been enhanced with the addition of extremely visible cybernetics, leaving her a mix of woman and machine who suffers doubts about her own selfhood. 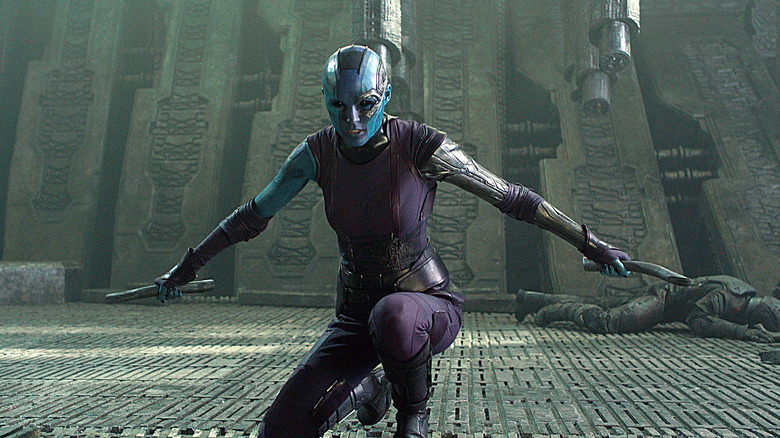 Her self-doubt, combined with her close relationship with Gamora, enables Nebula to turn against Thanos and become a sympathetic character and a grudging ally to the heroes. Whereas the Nebula of the comics was only ever a villain, even when she helped defeat Thanos or fought the Annihilation Wave, the cinematic Nebula is far more of an antihero. She refuses to join the Guardians of the Galaxy, but by the end of their second movie, she's no longer the group's enemy. In fact, her new stated mission is to kill Thanos herself. Karen Gillan returns to play Nebula in Avengers: Infinity War and its sequel. As of this writing, we don't know precisely what her role will be in the fourth Avengers movie, but since she said in Guardians of the Galaxy vol. 2 she was going to kill Thanos, that quest will surely play a role in the 2019 super-flick. The question that remains is how much guidance the comics could offer in what Nebula's role might be. 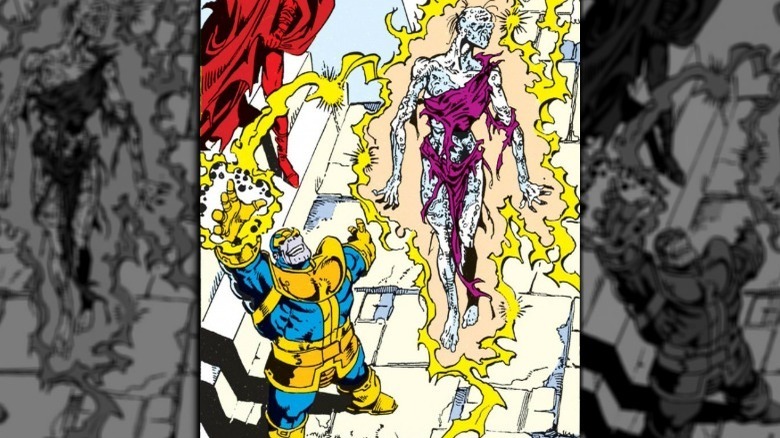 Considering how different her character and relationship to Thanos are, it may be that her fate is unrelated to anything that's come before. On the other hand, The Infinity Gauntlet is the basis of this story, and its possible some of Nebula's role there will be translated. Infinity War is about Thanos gathering the Infinity Stones (what the Gems are called in the movies), whereas the Infinity Gauntlet comics (and most likely the following Avengers movie) begins with him already having them all. It seems entirely possible that Nebula's quest to kill her adopted father will lead to a newly powered-up Thanos incapacitating her and then keeping her on display, like he did in the comics. 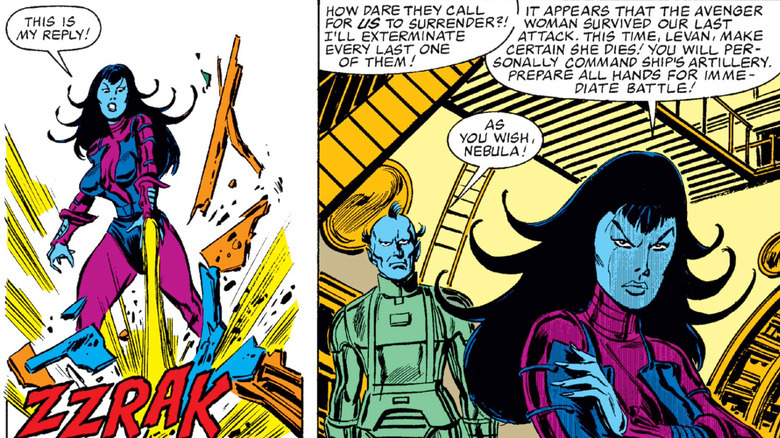 That could easily lead to Nebula stealing the power when nobody's looking, just like her comics counterpart did. But is there room for a minor character to play such a pivotal role in the defeat of Thanos? This is a movie where Captain America, Iron Man, Thor, and Black Widow will all need heroic moments of their own, among others. As unlikely as it may seem, however, it would be a moment that Nebula has earned, and may in fact be the moment that her entire character arc has built to once Avengers 4 debuts.